A discussion of how to play the apparent nuts when a chopped pot seems likely, but not definite. An online hand of 100NL in which a player's eagerness to get value is actually self-defeating. When the board is and a lot of money starts going into the pot, a feeling usually comes over you when holding your lip-licking that you're only going to make away with half of the pot. Running into chops in big pots is inevitable. But as we have seen before in this space, since we need to focus on getting value from those hands we beat, we need to concentrate on how we play our hand versus those hands that are not (in this example) . The following hand is an example of such a missed opportunity in practice. We're back at the 100NL ($0.50/$1) tables online, played six-handed in the "Zoom" format on PokerStars. This fateful pot began with a raise to $2.50 from an experienced regular sitting under the gun. A recreational player who had built a big stack called in the cutoff. 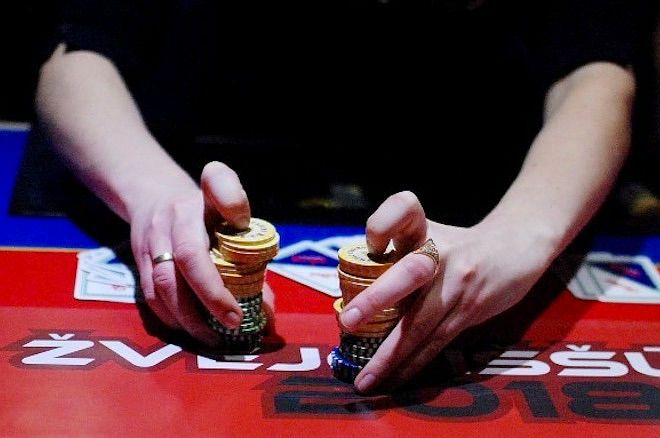 It came around to another recreational player in the small blind who had just doubled up the previous hand, and perhaps feeling a rush, he called. The big blind folded. Three players, then, saw the flop come . The small blind checked, then the initial raiser appeared to give up on the pot by checking as well. The cutoff wasn't interested in seeing it check through and bet $7, a bet the small blind happily snap-called. The initial raiser, as expected, got out of the way. The turn paired the five, but as it was the , meaning there would be no possible flush draws. Again the small blind checked, and the cutoff bet a rather small $10. When we view this bet size through the filter of the cutoff's larger flop bet size, we can exclude some of the strongest hands such as , , maybe even . In terms of made hands, this sizing progression often represents a hand that was top pair on the flop and wanted protection and now on this turn wants to bet, but doesn't know how far ahead it might be. Therefore it shies away from bombing the pot until it gets better evidence that it is in fact best. The small blind called again. The river card was the , making the final board . The small blind led out for $22. Now, there are a few hands which it is safe to say this bet could not represent. Slow played pocket nines, for example, has found itself in an unexpected pickle and will now either check-fold or (more likely) check-call. Hands that were bluff-catching, like or , are also unlikely to make such a bet (it isn't a blocker bet… it isn't a bluff… is it for value?). This leading river bet by the small blind could certainly be a bluff. A hand like springs to mind, but and are also possible. And of course it could likely be a value lead with a jack that does not want to see an overpair or check back. After the small blind's lead, the cutoff chose to raise all in for $200 more. It's easy to see that the small blind would be calling that shove with hands in any of these three categories, and would be folding everything else (i.e., the bluffs). To end the suspense, the small blind called and the pot was chopped, as both players indeed had hands in category No. 1 — hands that were not . There's more to discuss here, though. Consider that when the cutoff makes this raise, he does not give the small blind the opportunity to three-bet bluff at the pot. He also always get called by another hand in category No. 1, so there is no getting the small blind off of a chop. But (you say) no one is going to bluff-raise all in after the cutoff raises the river lead. What if the cutoff only min-raised to $44? It won't happen often, but small blind could make a stab at the pot for $66 (or more) with their and -type hands the times cutoff makes this raise. If we think about the situation from a theory perspective, the cutoff is going to have a lot hands from all three categories, and not that many bluffs. When a bet can hardly ever be a bluff, in theory, we should bet small. So were it possible to raise the $22 to $37, maybe, once the combinations are tallied, that would be the cutoff's solution sizing. Since the rules forbid it, $44 would be the next best size for his bluff-raises to most closely balance his value raises. All of that is a bit of an esoteric point, but it is worth making if only to point out that it is much harder for the cutoff's 200-big blind river-shove to be a bluff, when other sizes would have suited just as well. Therefore the cutoff is forsaking the chance, however small, at value! The truth, actually, is that the cutoff was value-cutting himself. Why couldn't the small blind have -suited or ? There is no reason. So sometimes he will call and the pot will be chopped, and occasionally he will call and scoop the cutoff with hands from categories No. 2 and 3. But the small blind will never bluff-raise with a hand not in any of the three categories, because the cutoff didn't give the small blind a chance to do so. That in itself should lead the cutoff to question whether there were a better size to raise.